Since the first Teenage Mutant Ninja Turtles movie was released in 1990, hundreds of thousands of live turtles, mostly water turtles called red eared sliders, were purchased for between $10 and $25 after each ninja movie was released. The result? Many, if not most, were dumped and even deliberately killed or flushed down the toilet. Remember people buying thousands of dogs that ended up in shelters after 101 Dalmatians came me out? Same problem. We're asking you to save a turtle's life and perhaps even your child's. In August, your children will be enjoying another edition of the extremely popular Teenage Mutant Ninja Turtles movie. This will include a whole new generation of kids who missed the 2007 animated film. It's fun and great entertainment. But, we are writing this to ask for your help. Since the first movie was released in 1990, hundreds of thousands of live turtles, mostly water turtles called red eared sliders, were purchased for between $10 and $25 after each ninja movie was released. The result? Many, if not most, were dumped and even deliberately killed or flushed down the toilet. Remember people buying thousands of dogs that ended up in shelters after 101 Dalmatians came me out? Same problem. Unfortunately, children do not realize that real turtles do not fly, perform stunts or do any of the exciting moves fictional movie turtles do. 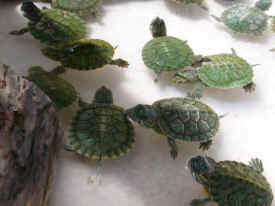 Parents, trying to please their children, purchased live turtles which ended up languishing in tanks. Or, when the kids realized after a few weeks that these were not ninja turtles, the turtles were dumped illegally into rivers and lakes as well as dumpsters, flushed down toilets or relinquished to shelters and overcrowded rescues. It's estimated that 90 percent died. As an aside, zoos do not take turtles. Here's the bigger problem. 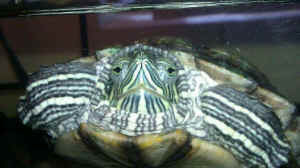 Turtles carry salmonella which can make a child very, very sick and can even kill them. That's why turtles less than four inches were banned from sale in the U.S. in 1974 and still are...tiny turtles easily fit into a child's mouth. Children also tend to touch the water and don't wash their hands. It's an ugly problem. A nine month old baby in Los Angeles got salmonella meningitis from a turtle after its parents touched it and then held the baby. We do not recommend live turtles or tortoises for children under 13 because of salmonella exposure and because the kids lose interest almost immediately. What can you do to help? Buy Ninja action figures and toys instead of live turtles and save a turtle's life, and perhaps even your child's.